Before dawn on Saturday morning last week, the phone and Internet went out, and I felt like a junkie without his fix or a teenager without his smartphone. This doesn’t happen often, but when it does, I realize how dependent I have become on this connection with the outside world. I should have just gone back to sleep, but I couldn’t. If I were guilty of having not paid my phone bill, I would have accepted responsibility for this isolation—but I signed up with the phone company for automatic withdrawals of their monthly fee from my checking account, so I knew that I was paid up. I hate giving anybody unfettered access to my small stash of money, and I feel as if a sacred compact had been violated. The next evening, this time during “prime time,” the connection went out again. It was driving me nuts, and I realized how irrational my reaction was. It was making me really angry. But you don’t need a submarine to crash the Internet or other critical infrastructure including banks, gas pipelines, and the power grid. Since the discovery of the Stuxnet computer virus in 2012, we have discovered that the Internet is surprisingly vulnerable to hacking and crashing via thousands of entry-points—and the fact is, an amazing amount of damage can be done from basements, coffee shops, dorm rooms (as well as from secret high-tech security facilities) everywhere. Regardless of the players, it is bound to happen someday—just like an asteroid. Just wait. 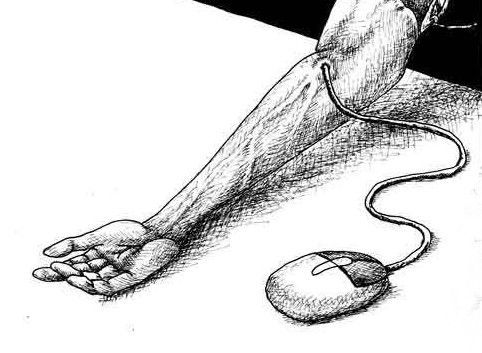 “Internet Addiction Disorder” (IAD) was originally proposed in 1995 in a satirical hoax essay by Ivan Goldberg MD, although some later researchers have taken his essay seriously. He took pathological gambling, as diagnosed by the Diagnostic and Statistical Manual of Mental Disorders (DSM-IV), as the model for his description. IAD receives coverage in the press, and its possible future classification as a psychological disorder continues to be debated and researched in the psychiatric community. I’m actually thankful for the occasional outage. It helps me prepare myself for the inevitable. 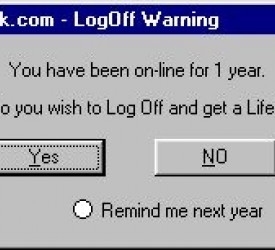 I hope that you will be similarly forearmed.